Video May 26, 2015 nanarhonda/beenblessed 1st Amendment, Antisemitism, Barack Hussein Obama, Benghazi, Benghazi ~ Sec. of State Clinton, Blogging, Christianity under attack in our own country, Democrats, Former Secretary of State Hillary Rodham Clinton, Geopolotics, GOP, HAMAS, Homeland Security, Human Shields, Hypocrisy, Idiocracy in Motion, Integrity, ISIL, ISIS, Israel, Liberals, Media, Memorial Day ~ Remember those who gave their all for us, Military, Muslim Brotherhood, Muslim Faith in the U.S., Navy SEALS, Palestinians, Personal, Personal Responsibility, Politics, Radical Jihadist Attacks, Simple Wisdom, The UNITED STATES OF AMERICA, We the People	CAIR, Islam is not peaceful unless you SUBMIT!, ISLAM means submission!, Muslims abuse OUR 1st Amendment Rights that our soldiers gave their lives for, Muslims go too far, MY SOAPBOX, nanarhonda is irate having seen this after honoring our Fallen on Memorial Day and wants the World to see it!, nanarhonda.com, POTUS defends Muslims and surpasses Christians, We the People DO NOT FEAR YOU!! !, when is enough ENOUGH? If the Muslims (CAIR) in The United States of America have the audacity to say this, THEN LEAVE THE UNITED STATES OF AMERICA and go back into the hell-hole from whence you came! I have had about enough of CAIR, Muslim Imam rhetoric in THIS Country, and a POTUS that encourages THEIR freedom of expression and freedom of religion while supressing OURS! THIS IS YET ANOTHER VIOLATION OF OUR CONSTITUTION and POTUS HAS BEEN IN DERELICTION OF DUTY FOR 71/2 YEARS and NOT ONE PERSON IN DC has the courage to a damn thing about him or his corrupt administration! We, the People, do not fear you! Has CAIR finally gone too far? If the Flag of the United States of America offends you, then you’re in the WRONG Country! Thank you to Americans – Strong for this photo! Seems like such a double standard… one is free expression and one is assault. 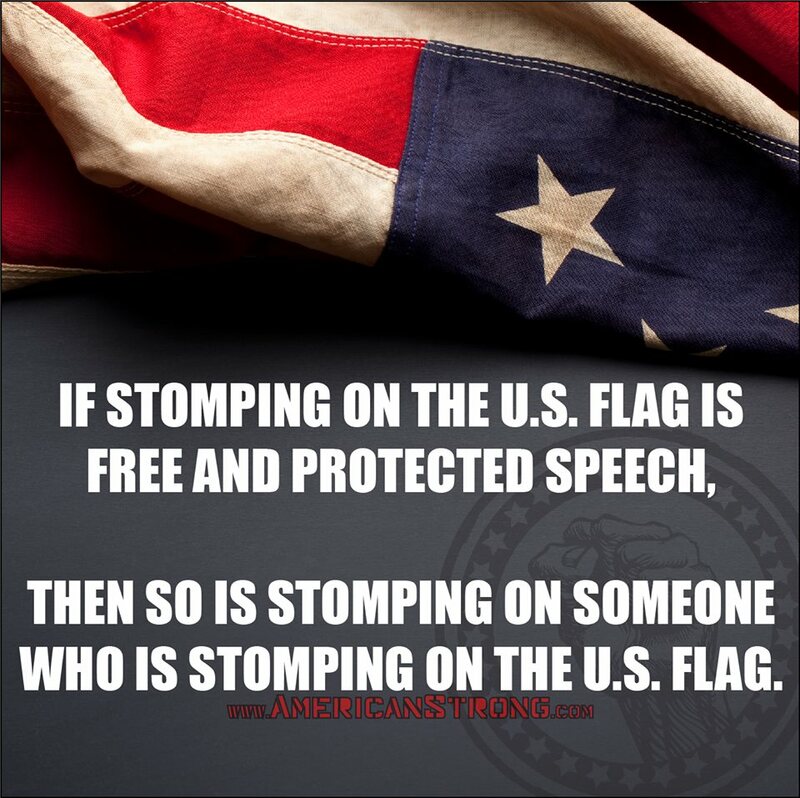 If the flag of the United States of America offends you and causes you to want to stomp on it, THEN LEAVE! There is nothing stopping you! OUR border is WIDE OPEN FOR YOU TO LEAVE! Get out!! Go!!! P.S. Title taken from Ken Davis’ DVD shot in Sheboygan, WI and stands true today! Promoting Common Sense One Person At A Time speaks out once again and I just have to share his YouTube video. He has a lot to say about this administration and what it has done to this country. See for yourself… and visit his website at Whatever Happen (ed) To COMMON SENSE. Well, its official! The Run for 2016! Everyone thinks that the run begins when the exploratory committees are formed. Truly, it really doesn’t begin until there are announcements for candidacy. But it becomes OFFICIAL when the mudslinging begins! And it has! There is an attack as against Sen. Dr. Rand Paul by Karl Rove & Jeb Bush! Bush hasn’t even announced his candidacy but he has the gall to go into cahoots with Rove to launch an attack ad! The RNC, headed by Reince Prieibus, mailed, to all the media outlets, a thumb drive of Hillary’s emails. Wouldn’t it be so refreshing, and actually worth paying attention to each candidate, if they each stuck to their own campaign? Each person that puts their name in the “hat” for the run for any election would do well to simply focus their campaign on THEIR plans, their solutions, their answers to OUR questions. No campaign should be “S/He who has raised the most money wins.” To be honest, it absolutely sickens me to see how much money gets spent during campaigns when our deficit is so enormous! Each candidate should have a solid platform to run on. They should be able to answer questions without having to refer to notes or being fed answers through an ear piece. Campaign managers aren’t the ones running for office so leave the candidate to answer for themselves! What this country needs are solutions and plans on how to bring those solutions into fruition. Mudslinging is for children and it doesn’t belong in politics! She talks about “the deck is still in favor of those at the top”… Ummm… where does she place herself in that deck? Oh, yeah, I forgot, she isn’t taking questions.